THE 2018 Poppy Appeal has so far raised over £31,000 – the largest amount ever raised. And with more money to count, organisers are hoping for an even bigger bumper total. Organisers have thanked the public for their generosity and support towards the Poppy Appeal, which helps servicemen and women affected by past and current conflicts. Poppy Appeal organiser for Frome, Maggy Daniell said, “The 2018 Poppy Appeal for Frome and hinterland has already banked over £31,000 and when Gift Aid and oddments are added, it should be close to £32,000.That is our biggest total ever. 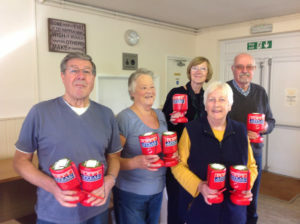 “We had all sorts of extra-generous donations for this special centenary year, in addition to lots of smaller ones – all of which helped to make it this fantastic total. So our thanks go to everyone who contributed. “The WWI centenary has been shared widely by people in Frome, not glorifying war but remembering its impact on ordinary people, many of whom lost family member. That generation has passed, and the money now raised by the Poppy Appeal goes to help others affected by later wars and traumatic experiences in service for our country. “As this is my last year, it is a good place to put on record my appreciation of all the volunteers who make up the team. It wouldn’t be fair to single some out, because each contributed in their own way. Although it is a only a small ‘thank you’ gesture, I hope they’ll all come to our Poppy Party on Friday 18th January at the Cricket Club. To enquire about volunteering, contact Maggy on 07854 918286.